From the moment you step from the front porch into our comfortable and sophisticated salon, you are experiencing the finest in hair care hospitality and professionalism. You can relax—we have more than 30 years of combined experience and we are totally on top of our game technically and fashion-wise. We make every effort to ensure that you have a comfortable, pleasant experience—we will treat you like you are a guest in our home. You are our focus, and your satisfaction is our priority. 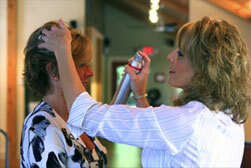 JH Hair Salon Roswell GA – Come Visit Us Today!